This year marks the 20th anniversary of URWERK, and a few weeks ago they formally launched the new limited edition UR-T8. 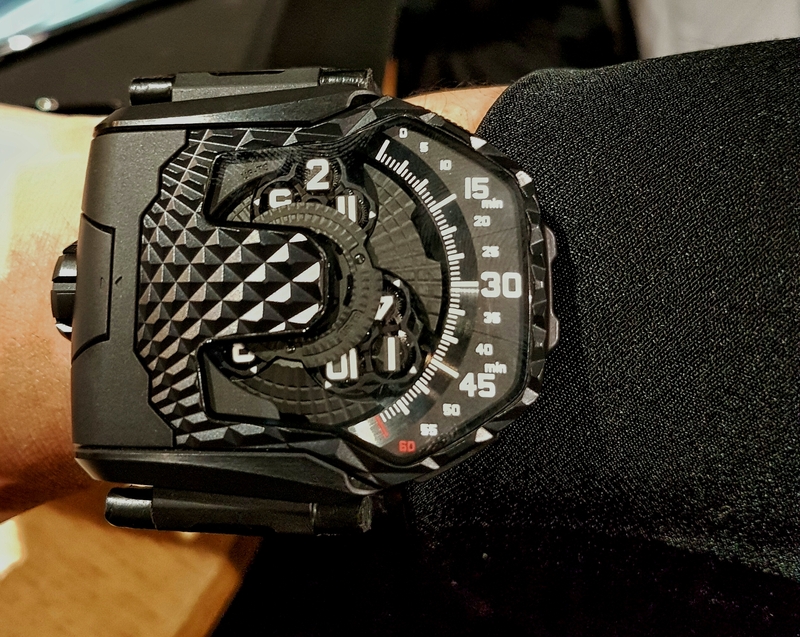 URWERK’s first transformable watch with their trademark satellite complication, each arm supports a satellite carousel with four rotating hour numeral modules on planetary gears. Not only this, but with the ability to flip the case to reveal a protective titanium shield it is, essentially, their idea of the 21st version of the classic Reverso, something which Martin Frei has noted. So how does it ‘transform’? You simply unlock the case from its cradle, flip it, and click it back in. Sounds familiar and easy, right? To then reverse it back so that the time-telling display is visible again you depress the two buttons on the case’s side to release it, lift, rotate 180° and click it back into its cradle. The TR-8 shows off a new version of the brand’s trademark satellite wandering-hour indication. Their classic four hour groupings on a three-armed carousel sweeps across a 60 minute scale to show the time. Inside is the automatic Calibre UR-8.01 with a spinning vane connected to the winding rotor absorbs any sudden rotor movements without compromising its winding efficiency and a power reserve of fifty hours. The satellite hours are both a function and design code of URWERK but the pure-URWERKness of the watch continues through to the oversized crown, general overall look of it, and of course, the size. At frankly, a ginormous 60.23mm x 48.35mm x 20.02mm, it is clearly not for every wrist. As such, we were surprised to find that on a ‘wearability’ level, it can actually be worn comfortably, albeit on the right wrist so that the protruding section goes up your arm and is less intrusive. I confess that I had not expected this to sit on my wrist in a manner that would feel even remotely comfortable on any level, so it was a pleasant surprise. This all being said, it is not just about wrist size but chutzpah. You do need a certain level of self confidence to wear this. 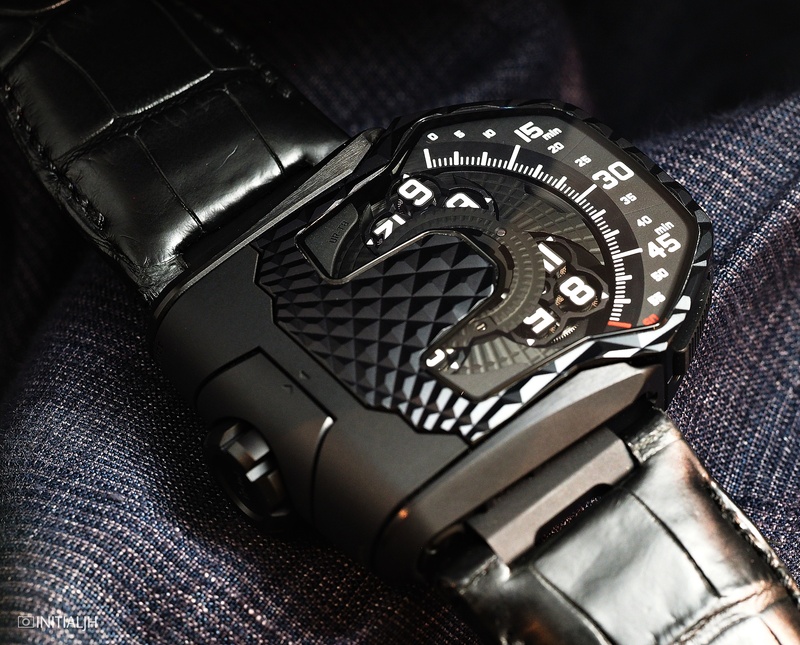 Since their first creation was launched in 1997 URWERK have continued to occupy a space in the world of watches that is genuinely unlike that of any other brand. There is no mistakening an URWERK watch for something else, and long may their resolutely idiosyncratic bravery continue. The new TR-8 comes in two limited editions of thirty pieces each. One is an all black version in titanium and one that is titanium and PVD-coated titanium.